The Buffalo Civil War Round Table acknowledges member Tim Touchette - recently returned from duty in the Persian Gulf - for his efforts to mark LeRoy Williams' grave in Oakwood Cemetery, Niagara Falls, as on which holds the remains of a Medal of Honor recipient. A bronze plaque wil soon be set in front of Williams' tombstone, and the BCWRT considers it an honor to have contributed a small sum towards the project's completion. It's sad when a culture loses its vocabulary for idealism, when irony replaces valor in the public imagination and bars any idiom for seriousness. Soldierly risks and sacrifices should neither be canonized nor trivialized, but, in Civil War studies, fact and fancy often seem to annul each other. In a war in which three million men served and over 620,000 soldiers perished, there is a temptation to smugly comment that no one can say who were most valorous. Yet this war saw Congress authorize the Medal of Honor. 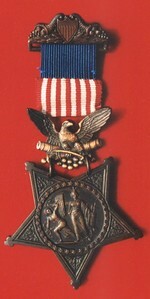 The Navy Medal of Honor was instituted December 21, 1861, and the Amy's July 12, 1862. Although originally meant to honor only seamen, petty officers, and enlisted men, Army officers became eligible in March of 1863 and those of the Navy on March 3, 1915, although some of the medals were conferred retroactively to earlier campaigns. As a symbol of their gallantry in action during the Civil War, it was bestowed upon 17 Marines, 310 Navy men, and 1199 members of the Army, no counting some that were later rescinded. There were twelve "double winners" of the Medal until the Regulations on Awards were changed in 1918 to read that no more than one could be granted to any one individual. Two Civil War seamen received two Navy Medals of Honor apiece, each having been cited for two separate actions. The only soldier to receive two Medals for his actions during the War Between The States was Thomas W. Custer, brother of the famous General. As the result of a "review" by the Board of Examiners of Awards of Medal of Honor, 911 names of Army recipients were struck from the "Medal of Honor Roll" on February 15, 1917. The stricken names included "Buffalo Bill" Cody, because he had earned his in 1872 while a civilian scout during the Indian Wars, and Dr Mary Edwards Walker, for the reason she had been an Army civilian contract surgeon despite her gallantry in treating wounded on Civil War battlefields. Their Medals were restored, however, in 1989 and 1977 respectively. Not restored were 864 recipients from the 27th Maine for whom President Lincoln had authorized Medals in June of 1863 "as an inducement to keep the Regiments on active duty for any of its members who volunteered for another tour of duty." 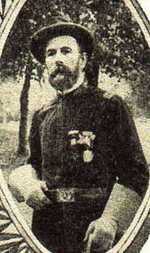 LeRoy Williams' Medal of Honor was issued during 1898 when he was 53, for "Voluntarily exposing himself to the fire of the enemy's sharpshooters and locating the body of his Colonel, who had been killed close to the enemy's lines. Under cover of darkness, with four companions, he recovered the body and brought it within the Union lines, having approached within a few feet of the Confederate pickets while so engaged, in action at Cold Harbor, Virginia, June 3, 1864." 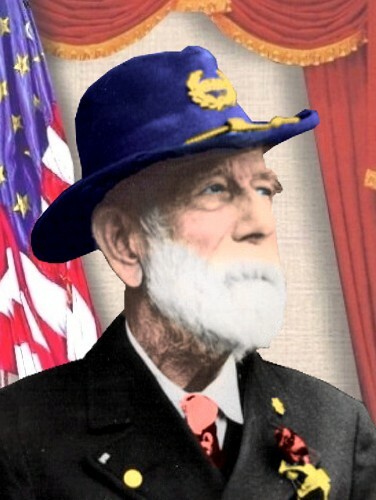 Born in Oswego, Williams signed up on July 29, 1862, as a private in the 129th NY Volunteers (redesignated December 1862 as the Eighth New York Heavy Artillery) at Batavia when a boy of barely eighteen years. He attained the rank of sergeant by early 1864, received a second lieutenant's commission dated October 28 of that year, and officially rose to a first lieutenancy during April, 1865. On June 5 of '65 he was transferred to the Tenth NY Vols along with a number of other men from the 8th NYHA when the Eight was discharged from service; First Lieutenant Williams was mustered out June 30, 1865. In May of 1864, the 8th NYHA received orders that indicated it would be among the "heavies" being deployed as infantry unit in an effort to provide the manpower for Grant's drive on Richmond. Colonel Peter A. Porter's regiment would undoubtedly provide a boost - his 1900 men had the fill of inaction after eighteen months of garrison duty. In his diary, a soldier in Company E chronicled the regiment's passage to the front. "May 16 - This morning found us in the hurry and business of packing, breakfasting, visiting the capital and finally starting for the wharf which we reached about noon. It was a grand sight as the regiment passed down Pennsylvania Avenue, extending as it did nearly from the capital gate to Seventh Street...It wa one o'clock before we were safely aboard the transports and when we reached Belle Plaine the sun was going down. It was quite dark before we were all ashore and the dead of the column was already winding along the hills in search of a camp ground for the night." A letter by John J. Sherman, Company G, described the scene on May 18, 1864, when the Eighth Heavies finally reached the front and encountered veterans from the Army of the Potomac. "Down the road we marched with flags flying and bands playing. The men were happy to be joining the Army of the Potomac and there was much singing in the ranks. Our uniforms were clean and neat and our brass buttons and shoulder plates shone in the morning sun. We were the proudest regiment to ever reach the front. But our pride was short lived... As we approached the veteran troops, there were cat calls and insults thrown out way. Many a begrimed veteran called to ask if we had brought our artillery with us. Others wanted to know if we had brought along our fortifications. Wounded men lined the road and tauntingly pointed to shattered legs and arms or to bloody faces and shouted that we would get our up ahead where the rebels were waiting... One old soldier, standing beside the blanket covered body of a mangled corpse, continued to cover and uncover the body as we marched past. It was more than new troops could take and soon many of the boys were making for the nearest clump of bushes to relieve themselves of breakfast. This also tended to bring forth cat calls, asking if we had brought our mothers and nurse maids along to sooth our hurt feelings." The Eighth soon ran into the 151st NY Volunteers, then in Rickett's division of the Sixt Corps, and a Niagara Falls soldier wrote home about how it felt to encounter these veterans and fellow citizens of Niagara County. "The 151st Infantry passed here yesterday. There were many hearty greetings between members of our regiment and the 151st... The boys of the 151st were quite worn out with continuous marching and fighting and we looked upon their demimated ranks, thinned by casualty and disease, their clothing begrimed with smoke, torn by briars and soiled with grease and dirt, their haggard faces bronzed by storm and sun and , as we contrasted their stormbeaten and bullet riddled flage with our own bright colors, we pointed to them and said, 'This is what we are coming to.'" The Eighth was introduced to combat during the skirmishing which followed Spotylvania in a brief action of May 19 later dubbed "Pine Forest" where eight men died and seventeen were wounded. The regiment performed well, and Captain Wm F Williams said that, "Colonel Peter Porter fearlessly rode up and down before the regiment during the action, urging his men to stand firm." Sgt Well Knowles told his kin back in New York that "we were awakened on May 20 by a cannon from our side shelling the woods to see where the enemy were, but none could be found. We threw out skirmishes and found the rebels had withdrawn and crossed the Po River, four mile away...We saw many poor fellows lying dead upon the ground. We took a number of prisoners, among which was one wounded rebel who said that he had shot at Col Porter three times and that he could have died happy if had only killed the colonel. He had been a prisoner at Fort McHenry and knew the colonel by sight." By the end of May, 1864, Grant had turned Lee out of his North Anna position and both sides were in long-intrenched lines ending near Cold Harbor in the southeast. Major Gen'l David Hunter was southbound, leading four federal divisions "up" the Shenandoah Valley toward Charlottesville & Lynchburg. Grant had also sent off Phil Sheridan with two-thirds of the Army of the Potomac's cavalry to destroy the Lynchburg-Richmond rail connections and then unite with Hunter. Hoping to aid the expeditions of Hunter & Sheridan by keeping Lee busy, and because he felt Lee's line to be stretched out "as thin and weak as possible," Grant made his ill-fated decision to attack the Confederate positions at Cold Harbor. At 4:30 A.M. on June 3, more than fifty thousand Yankees of the Second, Sixth, & Eighteenth Corps emerged from their lines along a mile-and-a-half front and began a wild rush toward the shadowy outlines of the enemy entrenchments, located just several hundred yards to the west. Despite some initial successes on the Union left, where elements of Gen'l Francis C. Barlow's division of the Second Corps temporarily captured a portion of the Rebel works, the Federal assault quickly disintegrated into what Bruce Catton called "a wild chain of doomed charges, most of which were smashed in five or ten minutes and none of which lasted more than half an hour." As Barlow's brigades fell back from the enemy works, Gibbon's division started out to reinforce them but unexpectedly hit a swamp which separated his units. Two brigades at last sloshed out the other side. One of these, under Brigadier Gen'l Robert O. Tyler and including the Eighth Heavies, swept over a Confederate advance position and captured several hundred prisoners. But Gibbon's division suffered a thousand casualties in less than twenty minutes and could not sustain the attack. Five thousand Union soldiers had already been lost in fighting along the Cold Harbor lines during the first two days of June, 1864. Though Grant assumed that he could avoid heavy losses on June 3 by promptly stopping the attack as he had once done at Spotsylvania, the front was so broad and the Confederate defenses so strong that seven thousand men fell in the first hour of the assault. Before the day was out, Assistant Secty of War Charles A. Danan, who was with Grant's HQ staff at Cold Harbor, reported that by noon "we had fully developed the rebel lines and could see what was necessary in order to get through them." By mid-morning, however, Gen'l Hancock opined that the Second Corps "had received a blow from which it can scarcely recover." Lee lost about 1,500 men on June 3. Niagara county lost 750 of her men in the Civil War, and 225 of them were members of the 8th NYHA who met their fate winter short space of twenty minutes of June 3 at Cold Harbor. The Niagara Falls Gazette for the June 8, 1864, stated that "It did not need the flags at half mast on Saturday to tell the stranger that some great calamity had befallen our village; it could be seen in every face he met; and the general gloom was a high tribute to the memory of the man whose loss was so universally mourned. Three weeks ago Colonel Porter's Regiment was ordered to the front and now from the front comes the news that he fell in Friday's engagement. This village, and indeed the whole county, join in mourning the death of Peter A. Porter and the many fine lads of his regiment who lost their lives at Cold Harbor on the 3rd." In a June 11 letter from his hospital bed, 151st NYV Captain Frederick W. Coleman wrote of Colonel Porter's demise. "The Colonel was struck in the leg and fell, then rising to his knees, he cheered on his men and immediately received a volley...he was within 50 feet of the Rebel rifle pits when killed..." The body remained in a "no man's land" until Friday night, June 3. Private John Heanne, Porter's body servant, was unwilling to believe him really dead and searched the field hospitals, hoping to find him among the wounded. He eventually encountered a wounded member of the Eighth who saw the Colonel's body at the time he himself had been wounded and "satisfied himself that he was really dead." Lt Colonel Willard W Bates, 8th NYHA, finally discerned Porter's corpse through his glass and sent out a detail to bring it in. Sgt LeRoy Williams took four men out in a rain storm on the night of June 3 and dragged the Colonel's remains into US lines. Pvt Galen S Hicks, age 31, had enlisted that very year at Lima; he was discharged from the 10th NYV as a sergeant in June of '65. Pvt John Duff, age 19, had joined up in 1862 at Claredon; he later served as an Artificer before discharge with his company on June 6, 1865. Pvt Walter Harwood, age 22, had enlisted in 1863 at Baltimore, Maryland; he was mustered out May 11, 1865, at Summit House Hospital, Philadelphia. Pvt Samuel Travis, age 20, had enlisted July 30, 1862 at Lockport, and would leave military service with most of the 8th NYHA in June, 1865. John Heanne counted six rounds in Porter's body: two in his neck, one in the heart, one in the abdomen, and one in each thigh. On Friday, June 10, a week from his death, Colonel Porter's remains arrived in Niagara Falls. All places of business were closed and the funeral, "a simple affair at the request of the colonel himself," took place from the St Peter's Church the next morning. Masonic rites were conducted at Oakwood Cemetery, on Portage Road. Porter was eulogized as one who "indeed fulfilled all the injunctions of the apostle Paul." Sixty years later, LeRoy Williams was laid to rest nearby.